Reg’s Dlog (Well, what else would you call a dog’s blog?) Isn’t nature weird? After the excitement a few weeks ago of the weaselpecker, where a weasel rode on a woodpecker, I discovered these three photos taken by the Old Girl’s dad. They aren’t very clear because the fish is a similar colour to the water, but they show a frog riding on the back of a fish. Actually, it looks like the frog is perched on the head of the fish. Something so odd deserves its own name and I’ve taken the liberty of calling it a ‘frosh’. I hate travelling backwards, can’t you swim in reverse? Such a strange union raises several questions. Who started it? Did the fish grab the frog? 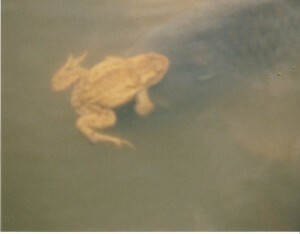 Or is the frog hitching a ride on the fish? Perhaps it was by mutual agreement, like car-sharing? Or perhaps the fish had set up a taxi service. For all I know, there might have been a queue of frogs on the bank, waiting their turn. Of course, it’s unlikely, but I suppose it might also have been an accident. Just imagine the frog swimming along on the pond minding its own business when a fish suddenly shot from the depths to the surface – and you have a frosh – the equivalent of a bug on the windscreen of a car. 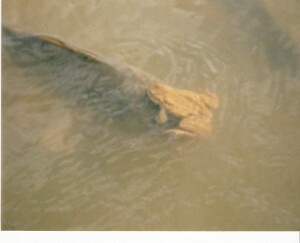 Or perhaps the fish is wearing the frog like a hat. Or what about a fight? They may have had a disagreement and when the photos were taken, they were eyeball to eyeball. Or a rescue? 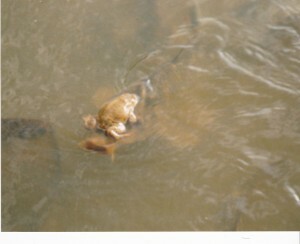 Perhaps the frog got into difficulties and the fish rescued it, valiantly carrying it to the side of the pond. Of course the Old Girl had to give her opinion and she came up with something completely ridiculous. She said the frog might be trying to mate with the fish, mistaking it for a frog. Well really! What a lot of far-fetched nonsense. You’d need to be seriously short sighted to mistake a fish for a frog. When I suggested it might not be a mistake and that they might have fallen in love, the Old Girl said I had an over active imagination and that I ought to take up writing stories. When I learn to type, I will. Anyway, it prompted me to wonder which animal I’d like to ride on. It definitely wouldn’t be a fish. How on earth do you hold on to one, anyway? They’re slippery customers. And what happens when it dives? Well, I suppose if you’re a frog, you don’t worry too much about being conveyed to the bottom of a pond. How about a ride on a woodpecker? Well, I suppose you’d get a good view of the countryside but you might get a bit shaken up when it started pecking wood. A hedgehog would be out of the question. A tortoise too uncomfortable and too slow. A cheetah would be too fast. But a sheep! Perfect. Both comfort and a sedate speed. And if I have to come up with a name for a dog riding on a sheep, it would be… hmm… let me see… how about sheepdog? You must excuse me, the Old Girl has just started laughing and I’d best go and find out the joke. Oh, before I go and find out what’s so funny, please don’t forget to buy a copy of the Old Girl’s ebook ‘Daffodil and the Thin Place’. There are no froshes, no weaselpeckers or sheepdogs although there is an ordinary dog called Nelson. Anyway it’s a good story and it all happens in a real place – St. Nicholas Church, Laindon with Dunton, Essex and all profits from the ebook will go towards renovation of the building. So, if you haven’t got a copy already, click here to go to the Muse It Up Publishing site or go to your favourite ebook retailer and buy ‘Daffodil and the Thin Place’. It’s easier to get hold of than a frosh.